El Presidente is back with some new ideas how to make the tropical Island a heaven on earth. Featuring new political and economic challenges, new strategies how to deal with them, new buildings, occupations and social factions, Tropico 6 guarantees long-lasting entertainment. Dear Tropicans, let us welcome back our beloved El Presidente! Returning with new ideas concerning economy, politics, social, and military spheres, he will make Tropico the land of milk and honey! Promising new buildings, he guarantees new ways of technological development, which also means also better job opportunities for all Tropicans. New ways of transport will help us communicate better across the islands. Did I say islands? Yes, because our El Presidente can now rule the whole archipelago for the first time in the series, making the Tropican community settle more islands. Fortunately, our Comandante…I mean Presidente has not lost his inimitable innate sense of humor which has accompanied the game since its beginning! Prove yourself once again either as a threatening dictator or a peace-loving statesman deciding the fate of your sunny paradise. Take care of the internal and external relations, resolve issues on domestic and international ground. Develop your country in many different fields, investing in agriculture, industry, and tourism. Control your budget wisely, foreseeing the probable expenses and income resulting from your actions. Finally, don’t forget about the people and their needs, as they constitute your electorate (unless you want to falsify the election’s results each time or ban them once and for all). Tropico 6 features a set of new options, designed to elevate your gameplay experience to a level unreached before. 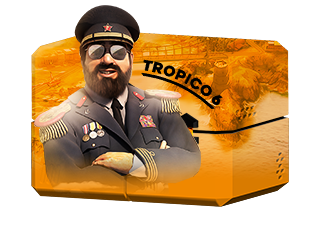 In addition to expanding your rule onto surrounding islands and governing the whole archipelago, Tropico 6 also enables you to construct bridges, tunnels and transport your citizens and tourists in taxis, buses or aerial cable cars. New infrastructure possibilities mean a higher standard of living for your people. The game also lets you send agents to foreign countries, who will come back with ready to build wonders and monuments. From the Statue of Liberty to Eiffel Tower, these new landmarks will easily distinguish your island among the rest. Finally, election speeches are back with the unique opportunity to make promises you will never keep. All these and many more new features make Tropico 6 one of the most compelling economic simulators ever made. Tropico 6 (PC) for Steam platform is a digital download product – no box included. The price applies to a digital version of the product. Warning! This product is region-locked, it CANNOT be activated in China. Below are the minimum and recommended system specifications for Tropico 6 Steam Key GLOBAL. Due to potential programming changes, the minimum system requirements for Tropico 6 Steam Key GLOBAL may change over time. Câştigaţi 3.89 RON de fiecare dată când cineva cumpără produsul acesta folosind reflink-ul dumneavoastră.